The George Washington Carver-Booker T. Washington Half Dollar was designed by Isaac Scott Hathaway. 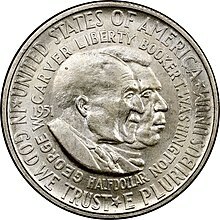 The obverse depicts side-portraits of George Washington Carver and Booker T. Washington and the reverse shows a simple outline map of the United States of America superimposed with the letters "U.S.A.", and the words "Freedom and Opportunity for All/Americanism" around the rim. It was minted in silver from 1951 until 1954, by authority of Public Law 82-151. It was the final issue of early commemoratives. The bill authorizing the coins was pushed by the George Washington Carver National Monument Foundation, and eventually passed on September 21, 1951, authorizing the mintage of a maximum 3,415,631 coins. This odd maximum mintage number took into consideration the remaining 1,581,631 Booker T. Washington half dollars that could be melted and struck as Washington-Carver coins, with the remainder being based off the 1,834,000 unused quantity earlier authorized for the Booker T. Washington half dollar. Like the Booker T. Washington half dollar, the design for this coin was created by sculptor Isaac Scott Hathaway. One of the reasons behind the Carver-Washington half dollar may have possibly been to oppose the spread of Communism among African Americans. One of Hathaway's early designs for the coin featured a three quarter profile portrait of Booker T. Washington behind the profile portrait of George Washington Carver on the obverse, while the reverse featured the American Legion seal with inscriptions such as "United Against the Spread of Communism." The coin would be produced for the following three years. They were often sold in three-coin sets (one coin for each mint mark), although large quantities of the 1951, 1952, 1953-S and 1954-S coins were struck for sale as singles. The sets were sold for between $9 and $10 each, although this would later be raised to $12 per set for the 1954 coins. In 1952, an attempt was made to issue the coins through banks. By the time the program ended in 1954, over a million coins had been distributed. Despite being the last early commemorative issue, little attention was paid when the program ended in 1954, as by this point most American coin collectors had become bored with commemorative coins. Owing to the fact that the Booker T. Washington and Washington-Carver Halves were little desired at that time, thousands of those coins were returned to the Mint for melting, while thousands more still held by banks were sold to speculators for a small premium (usually pennies) above face value. Until the George Washington 250th Anniversary Commemorative Half Dollar was issued 28 years later, in 1982, no more commemorative coins would be issued by the United States (not counting the circulating commemorative United States Bicentennial coinage). Any subsequent commemorative coin proposals were met by the Treasury Department with the long list of complaints that had arisen due to past abuses, such as the 1936 commemorative craze. ^ "Commemorative | George Washington Carver/Booker T. Washington | U.S. Mint". www.usmint.gov. Retrieved 2019-02-19. ^ a b c d "1952 Washington-carver 50C MS Silver Commemoratives". www.ngccoin.com. Retrieved 11 April 2019. ^ a b c "1951-1954 George Washington Carver Half Dollar Commemorative Coin". Retrieved 11 April 2019. The Eisenhower Commemorative Dollar is a United States commemorative coin minted in 1990 to celebrate the 100th Anniversary of the birth of General/President Dwight D. Eisenhower. This coin is not to be confused with the Eisenhower Dollar or the Eisenhower Presidential Dollar which were regular issue American coins. The Alabama Centennial half dollar, or Alabama half dollar, was a commemorative fifty-cent coin struck by the United States Bureau of the Mint in 1921 as a belated acknowledgement of the 100th anniversary of Alabama's admission to the Union in 1819. The coin was created by Laura Gardin Fraser, who became the first woman designer of a coin. The Elgin, Illinois, Centennial half dollar was a fifty-cent commemorative coin issued by the United States Bureau of the Mint in 1936, part of the wave of commemoratives authorized by Congress and struck that year. Intended to commemorate the centennial of the founding of Elgin, the piece was designed by local sculptor Trygve Rovelstad. The obverse depicts an idealized head of a pioneer man. The reverse shows a grouping of pioneers, and is based upon a sculptural group that Rovelstad hoped to build as a memorial to those who settled Illinois, but which was not erected in his lifetime. The McKinley Birthplace Memorial dollar was a commemorative coin struck in gold by the United States Bureau of the Mint in 1916 and 1917, depicting the 25th President of the United States, William McKinley. The coin's obverse was designed by Mint Chief Engraver Charles E. Barber, and the reverse by his assistant, George T. Morgan. As McKinley had appeared on a version of the 1903-dated Louisiana Purchase Exposition dollar, the 1916 release made him the first person to appear on two issues of U.S. coins. The United States Sesquicentennial coin issue consisted of a commemorative half dollar and quarter eagle struck in 1926 at the Philadelphia Mint for the 150th anniversary of American independence. 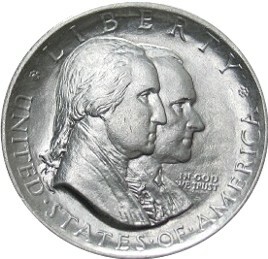 The obverse of the half dollar features portraits of the first president, George Washington, and the president in 1926, Calvin Coolidge, making it the only American coin to depict a president in his lifetime. The Cincinnati Musical Center half dollar or Cincinnati Music Center half dollar is a commemorative 50-cent piece struck by the United States Bureau of the Mint in 1936. Produced with the stated purpose of commemorating the fiftieth anniversary of Cincinnati, Ohio as a center of music, it was conceived by Thomas G. Melish, a coin enthusiast who controlled the group which was allowed to buy the entire issue from the government, and who resold the pieces at high prices. The five Panama–Pacific commemorative coins were produced in connection with the 1915 Panama–Pacific International Exposition in San Francisco. Struck at that city's mint, the issue included round and octagonal $50 pieces. Excepting modern bullion coins, these two gold pieces are the highest denomination ever issued and the largest coins ever struck by the United States Mint. The octagonal $50 piece is the only U.S. coin to be issued that is not round. The California Pacific International Exposition half dollar, sometimes called the California Pacific half dollar or the San Diego half dollar, is a commemorative fifty-cent piece struck by the United States Bureau of the Mint in 1935 and 1936. Robert I. Aitken designed the coin. Its obverse depicts Minerva and other elements of the Seal of California; the reverse shows buildings from the California Pacific International Exposition, which the coin was issued to honor. The Old Spanish Trail half dollar was designed by L.W. Hoffecker and minted in 1935. The Wisconsin Territorial Centennial half dollar was designed by David Parsons and Benjamin Hawkins and minted in 1936. The obverse depicts a badger and the territorial seal, while the reverse shows a pick axe and lead ore. The Lynchburg Sesquicentennial half dollar was a commemorative half dollar designed by Charles Keck and struck by the United States Bureau of the Mint in 1936, to celebrate the 150th anniversary of the 1786 incorporation of the independent city of Lynchburg, Virginia. The obverse of the coin depicts former Secretary of the Treasury and U.S. Senator Carter Glass, a native of Lynchburg. The reverse depicts a statue of the Goddess of Liberty, with Lynchburg sites behind her, including the Old Courthouse and the city's Confederate monument. The Columbia, South Carolina Sesquicentennial half dollar was designed by A. Wolfe Davidson and minted in 1936. The obverse design depicts the personification of justice holding a sword and scales and standing between the Old State House and the New State House built, while the reverse shows the Palmetto tree, South Carolina's state symbol, surrounded by 13 stars representing the original Thirteen Colonies. The Battle of Antietam half dollar was designed by William M. Simpson and minted in 1937 to commemorate the 75th anniversary of the Battle of Antietam. The obverse depicts Robert E. Lee and George McClellan, and the reverse shows Burnside's Bridge. The Booker T. Washington Memorial half dollar was designed by Isaac Scott Hathaway and minted in silver between 1946 and 1951. The obverse depicts Booker T. Washington. The reverse shows the cabin in which Washington was born, now the Booker T. Washington National Monument, and the Hall of Fame for Great Americans, in which Washington is honored. The description on the reverse reads "From slave cabin to Hall of Fame." The Illinois Centennial half dollar is a commemorative 50-cent piece struck by the United States Bureau of the Mint in 1918. The obverse, depicting Abraham Lincoln, was designed by Chief Engraver George T. Morgan; the reverse, based on the Seal of Illinois, was by his assistant and successor, John R. Sinnock. Morgan's obverse is based on the statue by Andrew O'Connor.